Creating a straight line can be difficult. Imagine having new cabinets installed that are not level; it would not be a pretty sight. Of course you can use a traditional spirit or bubble level to keep your pictures straight, but they can be inaccurate and limit the distance that you can assure is level. A great alternative to this type of level is a cross line laser level. It will give you a vertical and a horizontal axis to go by when you need something to be level, but what features are necessary for this type of level? This guide will help you figure that out and also give you four different options that you can explore. One of the variants is a budget friendly option that you may want to consider as well. 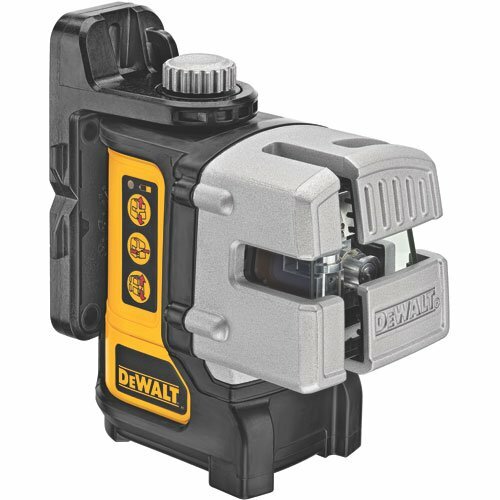 DEWALT, which is a company that was established in 1924, is one of the most established manufacturers of hand tools and power tools available today. They have been making a line of durable products that you have been depended on for almost a century, and our gold pick, which is the DEWALT DW089K, is one of their amazing creations to help you with your construction needs. This laser level is a compact tool that is approximately 11 inches long, 11 inches wide, and five inches high. In addition, it is light weight and extremely easy to take from job to job; its weight is just under five pounds. This laser level features a three beam style that gives you a traditional cross line level with a horizontal and a vertical line as well as an additional beam that is angled towards the side of the device. This feature gives you additional 90 degree angle marks that you can see on the ceiling, the floor, and the side wall. This extra beam means that you do not need to use an additional level when installing your cabinets around the kitchen. It also makes it easier to lay tiles and place windows. The beam of this device is a class II laser that is red in color, and it is bright enough to be seen in direct sunlight. It is designed with laser diodes that emit at least double the light strength of other models. This unit is extremely accurate, with 1/8th an inch accuracy at a distance of up to 30 feet. The beam can be seen for a distance of up to 50 feet, but the accuracy decreases slightly after a point. The unit is a self leveling laser that adjusts itself four degrees in either direction. If it is farther off than that, you can use the micro adjustable knobs to align the angles to fit your needs. This cross line laser level is designed to be a durable tool that you can use for years, so it has an IP level of 54, and it is water resistant in the event that you get caught in the rain while you are using it. The unit is designed with a built-in magnetic pivot to give you all of the angles you need with ease. In fact, you can simply use the ceiling mount that is included with the packaging to mount and secure the device to any metal surface. If you prefer to use a tripod, there is also the option to purchase one to use with this unit as well. Insofar as power is concerned, this level utilizes four AA batteries, which come with the purchase of this tool. This three beam laser is designed to operate with low power consumption, so you can expect a pair of batteries to last up to 30 hours. When you purchase this tool, you will also receive a convenient toolbox to carry the unit in as well as a three year warranty to cover any malfunctions that may occur with the device. 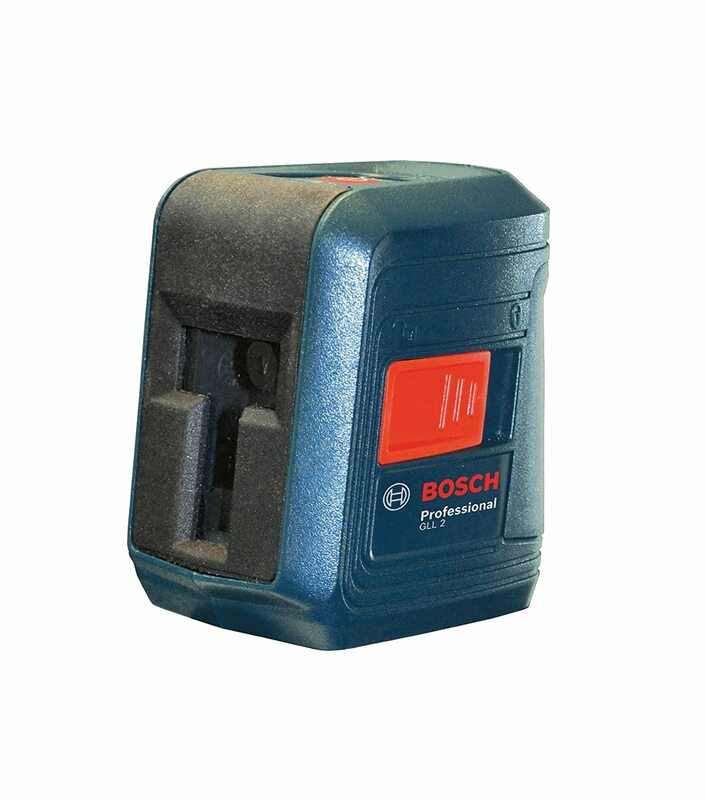 Our silver pick is the Bosch GLL 2, which is a great cross line laser level that has an extremely compact design. It is about three inches long, three inches in width, and three inches high. It is also designed to be lightweight and easy to maneuver when you are working on a project, so it only weighs in at a little less than two pounds. The laser beam that is emitted from this tool is red in color, which makes it easy to see in most light situations. It also features a cross laser design that can be used as a single vertical beam, a single horizontal beam, or you can combine the two to create a cross. The GLL 2 is an extremely accurate tool, which makes it great for laying tiles that you need to be perfectly aligned. IT actually has a 3/16th of an inch precision level that can be seen at distances of up to 30 feet from the source. The beam can be seen from a distance of at least 50 feet, but after 30 feet, the accuracy will begin to decrease. This unit is a self leveling tool that can be adjusted up to four degrees from either direction. If the tool cannot accurately be adjusted within those degrees, then an LED light that is located on the top of the tool will begin flashing red to let you know that you need to manually adjust the tool. Mounting this laser level is actually quite simple. A clamp mount is included in the packaging that will enable you to attach it to almost any surface, and if that is not sufficient, a tripod is also included to ensure that the unit can be mounted properly. Once the unit is mounted, adjustments can be made using the keypad. This tool requires two AA batteries to function, but the power consumption is relatively low, so each set will last you at least 15 hours. In addition, when you decide to purchase this cross line laser level, you can also expect to receive a two year warranty to cover any issues that may occur with the product. 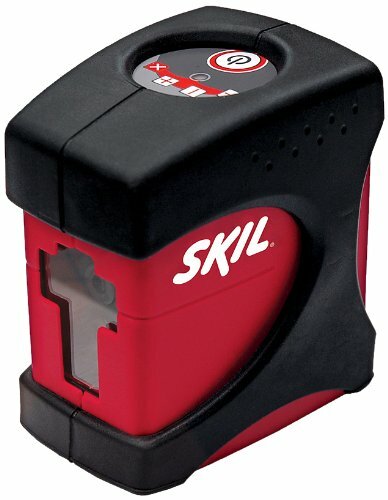 The SKIL MT 8201, which is our bronze pick, is a cross line laser level that is designed to work perfectly for any job. The tool itself is 17 inches long, ten inches wide, and about four inches high, which makes it compact enough to mount in most locations; in addition, it is light enough to carry from location to location as you need, especially since it only weighs three pounds. The laser that is emitted from this unit is red in color, which makes it stand out in many indoor lighting situations. This small tool is designed to produce a straight beam in less than three second, so to fully accomplish that feat, it is a self leveling device. It can correct the level accuracy up to four degrees in either direction, but if more adjustments need to be made manually, the unit will inform you with a flashing LED display. The level is designed to be extremely accurate with any measurement you need to make; in fact, it is about 1/4th of an inch at 30 feet, which is a great distance for most levels to be able to reach with pinpoint accuracy. Of course, since this tool is a cross line laser level, there are two beams that intersect. These beams can be used individually, as a vertical and a horizontal projection, or they can be combined and used as a cross to create right angles when you need them. The lines can also be adjusted and used at an angle, which is great for railings on a staircase or even placing pictures on the wall as you go up the stairwell. This laser level requires three AA batteries to function, so make sure to always keep a few extra on hand for larger projects. In addition, you will receive a tripod for mounting the unit as well as a case for carrying it in with your purchase. When you are making improvements to your home, you need to make sure that certain renovations are level. 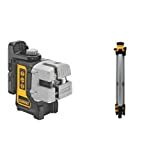 Installing new kitchen cabinets, creating a new doorway, or re-tiling a bathroom are all reasons that you could need a cross line laser level, but as a DIYer, you may not want to spend as much on your tools as someone who needs them for professional projects. 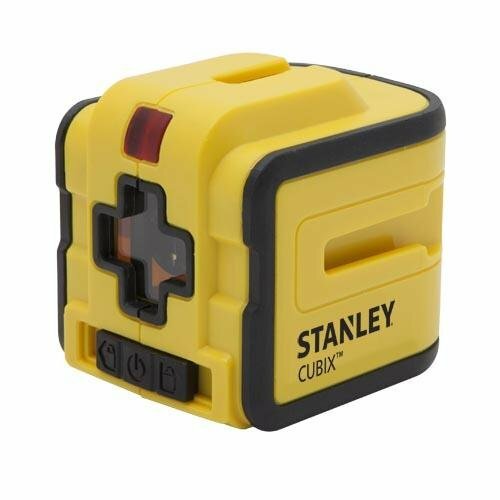 The Stanley Cubix Cross Line Laser is a device that is most likely perfect for your needs. It is a small, compact device that can easily be stored away and out of sight; in fact, it is only about eight inches long, six inches wide, and two inches tall. It is also very convenient to tote around when you need, as it only weighs a little more than a pound. Since it is a cross line laser level, it has two beams that can be used individually or together to create the angles that you need. This unit also has a locking pendulum, which makes angles that are not at 90 degrees much easier to create. Insofar as accuracy is concerned, this tool does not fall behind because of its lower price point; in fact it has a 5/16th inch accuracy level at a distance of up to 12 meters. In addition, the brightness at this distance is amazingly easy to see. The beam can be seen at a maximum distance of 50 feet, but the visibility and accuracy may diminish a bit. This unit is a self leveling tool, which means that making adjustments is rarely a requirement, but when it is needed, it is simple to complete. This laser level requires two AA batteries to function. One feature that makes using this device more convenient is the fact that it can be mounted from five of the six sides, so it should be able to be used for most products. In addition, our ballin’ on a budget pick is the only cross line laser level on our list that comes with a limited lifetime warranty, which says a lot for the quality of this tool. The most important consideration of any level is accuracy. Whether you are remodeling your home or arranging a collage of pictures on your wall, you need your level to be accurate to get the job done correctly. The level that you decide to purchase does not have to be perfect, but it does need to be at least -+3Xm to assure that the project you are taking on is not effected by an inaccurate level. Owning a model that produces a long beam that can adequately reach the other end of the room that you are working in will make completing your task go much quicker. Many levels reach a range of at least 30 feet, which is more than enough for most indoor projects, but does that cover your outdoor needs? Another consideration that you will need to make is regarding visibility. What good is a beam that you cannot see? A laser must have a light that is bright enough to see in both normal lighting situations and low light situations. You can select a beam that is either green or red in color, but make sure that it is visible. Green lasers can be more visible indoors, but if you work outdoors as well, you may wish to make sure it is viable for those situations as well. If you work in a profession that requires a cross line laser level, it is possible that the tool will get bumped around and possibly dropped from time to time. You want to make sure that the laser level that you select is able to take a little abuse. It should also be water and dust resistant to improve the longevity of its life span. To help determine how well the tool will hold up against the elements, you can look at the IP rating. The higher the IP rating is, the better it will be as an outdoor tool. A good cross line laser level should have an IP rating of at least 67, which will make sure that it is resistant to water and dust. When you use a laser level on a daily basis, it is important to be able to set the level quickly each time it is being used. When selecting a laser level, you can either have a manual one or a self leveling tool, so decide which works best for your needs. A good laser level should be able to be set up quickly without much hassle to use. They often feature digital displays and buttons that are easy to understand so that even a novice level user can figure out the tool. Some laser levels can be more difficult than others to install, so make sure to find one that will not take up too much of your valued time. All cross line laser levels use battery power, so it is important to finds a level that uses a battery that lasts as long as possible. The last thing you need is to be required to constantly recharge your level while you are attempting to complete a project. Laser levels may seem like a safe tool to use, but remember that the actual laser can be harmful to you and others in the area. Any laser level that you purchase must be limited in strength so that it does not burn your skin or cause eye damage. It is important to never look directly into the source of a laser beam as well. Laser class I and II can cause eye damage but only through magnification, so this is the safest option you can purchase. IIIA and IIIB can cause unwanted skin and eye damage, so you will need to be careful using this laser strength. The strongest is an IV class laser, which can ignite upon contact with the beam. It can be very hazardous to your eye and skin. If you use a cross line laser level for professional uses, then you know that you will need it to be able to be mounted in many different manners. You may need a line to come from a wall, a doorway, or a railing in indoor scenarios, but in the outdoors, a tripod may be needed. Make sure to get a laser leveling tool that can be mounted in any location that you desire. Cross line laser levels vary greatly in price, so make sure that you know the budget that you are working with before you find a level that you like for nearly $300. Also, make sure the tool comes with a warranty, especially if you are choosing to purchase one of the more expensive laser levels on the market. If the laser falls and breaks, you will appreciate having a three year warranty to cover the repair costs. Leveling a set of cabinets with a spirit level can be cumbersome and unwieldy. Cross line laser levels are the future of leveling when it comes to construction, electric, and interior design needs. Hopefully this guide has helped you keep a level head while deciding which product to purchase. If the cross line laser levels in this guide do not fit your needs, then take another gander at our pre-purchase considerations to help you find the exact tool that you need to keep a marble from rolling on your table or countertop.